The main suggestion, I hate to say it, is the one nobody wants to hear. In order for them to change their eating habits, you will most likely have to change yours too. It doesn’t matter if you don’t want or need to lose weight. It’s a team effort that will require you to work together in order for it to be possible. Food can be an addiction for many people. Think about an alcoholic in comparison. If your significant other was an alcoholic in recovery, would you mix cocktails and take shots of tequila right in front of them and expect them to not want to join you? I hope not. Whether or not it’s intentional, it’s sabotaging your loved one’s efforts to quit. The same goes for eating. You can’t expect your loved one to eat chicken and broccoli for dinner while you’re ordering pizza and eating ice cream for dessert. It makes it much more difficult for them, whether they tell you it’s ok or not. 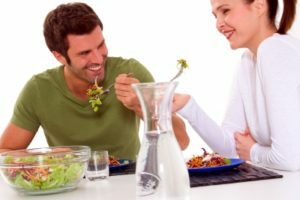 If you want your significant other to lose weight successfully and with as little agony as possible, please set a good example. If you are the cook of the family, start cooking healthy meals with lean protein and lots of vegetables. Stop cooking with loads of oil and butter. Limit breads, rice, pasta, and other starchy items to one serving, if at all (that’s ½ cup cooked rice, pasta, noodles, etc.) Stop baking cookies and pies. If you’re not already an avid cook, do some research so you know some healthy cooking techniques (such as roasting, barbecuing, broiling, poaching, etc.) Stop requesting pizza and take-out chinese food for dinner. Don’t cater to any unhealthy eating habits they may have, either. You can also try one of those programs that ship ingredients and instructions to cook fresh meals at home a few days a week such as Hello Fresh or Blue Apron. They are usually healthy and fairly low in calories, plus it teaches you the skills to cook these meals yourself. Even though these programs are not specifically for dieting, I have had many people tell me they lost weight through a program like this without even trying. If you eat out a lot: Suggest a restaurant that you know has healthy options. When looking at the menu, suggest to your loved one that you share your dishes so you each get ½. If your significant other is deciding to order something indulgent or high-calorie, order a salad or something light and ask to swap ½ his/her meal for ½ of yours. Even better, opt to cook at home instead. You will most likely save a ton of calories each time you decide to cook a healthy meal over eating in a restaurant. If your loved one is the cook of the family, tell them you would like to start eating healthier so you don’t need all the extra sides and garlic bread, etc. but you would like more vegetables. If you tell them you won’t eat it most likely they won’t make it just for themselves. If they don’t want or know how to cook this new healthier way, offer to make dinner more often. Offer to take a healthy cooking class together for ideas and inspiration. Suggest you and your loved one start taking walks together in the evening or small hikes on the weekend, or anything else that gets you both moving. Suggest you join a gym together. They may be up for it if you are going with them. Instead of telling your loved one that they need to lose weigh t, tell them you have decided to focus on healthier eating habits for yourself and you would love for them to join you in your efforts so you can live a long, healthy life together. Start doing it for yourself and most likely they will follow suit. The key is not to make them feel like you are forcing a diet on them, only to lead them in the right direction. Your significant other needs to make the choice for themselves. They need to know that this is something you can do together, and they have your love and support along the way!